This Small-Cap Cannabis Stock Is Up Big in a Down Market. Here's Why. Medical Marijuana's stock has started to heat up. Here's why. Pot stocks, by and large, have had an awful week. Top players like Canopy Growth (NYSE:CGC), Cronos Group (NASDAQ:CRON), and Tilray (NASDAQ:TLRY) have all seen their shares take a step back this week. Oddly enough, though, these industrywide declines have occurred against the backdrop of Altria Group's (NYSE:MO) massive equity investment in Cronos last week, as well as the passage of the 2018 Farm Bill this week that is intended to legalize hemp in the United States. Amidst this sea of red, however, there has been one company producing stellar gains for its shareholders over the last few trading sessions. Namely Medical Marijuana (NASDAQOTH:MJNA), which -- despite its name -- does not actually operate in either the medical or recreational side of the cannabis industry, but rather within the confines of the less controversial hemp oil space. Why is Medical Marijuana's stock breaking out this week? Let's dive in to find out. 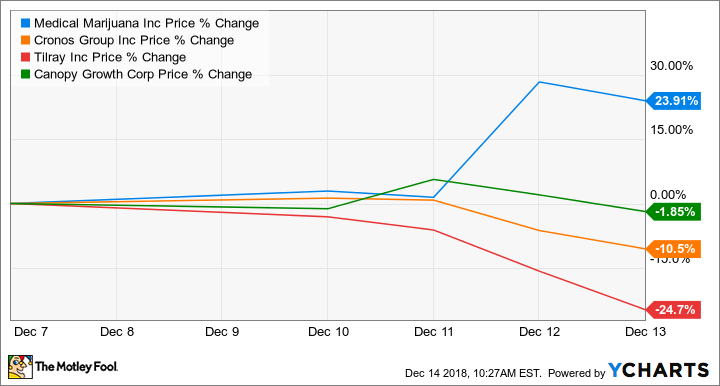 Unlike Canopy Growth, Cronos Group, or Tilray, which have all benefited immensely from the so-called "green rush" this year, Medical Marijuana's stock has actually lost a significant chunk of its value in 2018. The long-standing issue weighing on the company's share price has been the legal status of products containing cannabidiol (CBD), such as hemp oil. Despite the company's argument that its products are derived from parts of the cannabis plant excluded from the Controlled Substances Act, hemp itself has been on shaky legal ground for years. That fact has created a black cloud around Medical Marijuana's core business prospects. Fortunately, the 2018 Farm Bill should remove this particular overhang for CBD-oil producers like Medical Marijuana. And investors are obviously thrilled with this groundbreaking development, based on the sharp reversal in the company's share price this week. However, Medical Marijuana's shares are also getting a boost from the company's improving fundamentals. Over the first nine months of the year, for instance, the company's revenues topped $42.1 million, according to its third-quarter earnings release. While that may not sound like a whole lot, it does represent a 146% increase over the same period last year, implying that Medical Marijuana's business is starting to heat up. And with the company's products moving out of the shadows and into the mainstream, this favorable growth trend should continue to gain momentum going forward. Is Medical Marijuana's stock a buy? Unfortunately, this promising CBD oil company still has a lot of work to do before its shares can be considered a solid investment. Point blank: Medical Marijuana's stock presently trades on the largely unregulated over-the-counter exchange and its share price is hovering around a mere $0.10. That's not exactly a fertile setting for sustainable share price appreciation. The good news is that this newly minted Farm Bill may pave the way for Medical Marijuana to attract an equity partner, perhaps in the same manner as Canopy Growth's partnership with beverage giant Constellation Brands earlier this year or Cronos's recent tie-up with Altria. Following this Farm Bill, after all, there are probably a number of consumer goods companies champing at the bit to add a CBD-infused product to their portfolio. All told, Medical Marijuana is an intriguing watch list candidate because of the favorable tailwinds within its core area of expertise -- tailwinds that could spur a major partnership. However, management arguably needs to address the company's rather problematic share structure, and subsequently uplist to properly regulated exchange, in order to appeal to a broader base of investors. Until then, this stock is arguably suited only for ultra-aggressive growth investors who are comfortable with high risk.